He quickly enters into the living room where the safe is, removes the famous painting by Monet, takes out his small computer calculator, lines the calculator with the safe, watches the numbers as they change from one-set of codes to another, until the safe's secret codes come up unlocking the safe where the Diamond necklaces and other expensive jewels are and steals them. In the meantime, the owners are at a friend's party, while this theft is taking place. Of course, the burglar gets caught in the end. You can read about stories like this scenario in many books that you'll find in your popular bookstores or see these stories unfold in a movie. 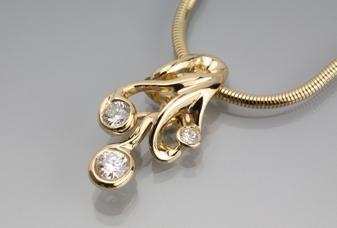 However, the history of the pendants and diamond necklaces is just as intriguing as well. It all started in the 16th-18th century with trades between Africa and Europe. Fore four centuries, the Republic of Congo and Angola were the most powerful of places for trade with the European countries. The trade dealt with the exchange of goods to Africa from Europe for African slaves or local products such as: rubber, wax and ivory. Another trade item to the Europeans from the Africans was the necklace of the Chokwe chief which was a traditional measure of success for the owner. Diamond necklaces were founded with affairs attached to them by the European Royals in the 18th century, such as, the affair or notorious scandal in Louis XVI of France court. In 1784, a gentleman named, Cardinal de Rohan was told by Countess Jeanne de la Motte that he could get back in favor with Queen Marie Antoinette, after being out of favor with her for whatever reason, by negotiating for the queen the purchase of a certain 500 diamonds necklace, that she wanted to get secretly. 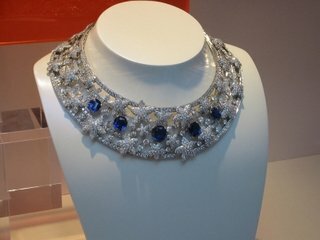 So, Rohan contracted with jewelers to pay for this necklace of 500 diamonds in installments. However, he could not pay for the first installment in full and the jewelers asked the queen for full payment. Later, the necklace that Rohan thought was in the queen's possession, was broken up into stones and sold in London. In 1785, this crime caused Rohan, the countess, and an impostor named, Alessandro di Cagliostro, accused of being an accomplice, to get arrested. Cardinal de Rohan was cleared of the charges of fraudently acquiring the necklace, but, he was banished from the court. Alessandro di Cagliostro was also cleared of the charges. However, the countess was charged and sentenced to life in prison, she later escaped to England. The queen had no part in the affair, but, the scandal confirmed the belief of many in her excessiveness and self-indulgent manner. 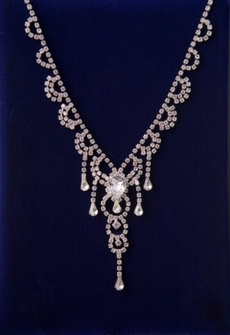 Diamond Pendant Necklaces are also noted for famous sayings: "Diamonds are forever" and "Diamonds are a girl's best friend", the popular quote by Marilyn Monroe. Diamond pendant necklaces are beautiful and loved by many. They come in many different colors, shapes and designs. Pendants come in intricate and elaborate motifs, such as, geometric figures, crowns, stars, butterflies, letters, shows, hearts, sandals, twists, pinwheels, circle of life pendants, just to name a few. The necklaces come in different ranges of colors: white diamonds, colorless diamonds, red stones, pink stones, yellow stones, and many other colored diamond stones. Many times, colored diamonds are paired with colorless diamonds to make startling exhibitions. Some diamond necklaces are famous like the Star of the East, a 94.80-carat pear-shaped diamond, mounted on a chain below a hexagonal emerald of 34 carats and a pearl of 32 grains, a fine necklace which might have belonged to the Sultan Abd al-Hamid. In any case, Mrs. Evalyn McLean purchased it from Pierre Cartier in Paris, France in 1908 on her honeymoon with husband Mr. Edward B. McLean. Today, diamond pendants and necklaces can be purchased at your favorite jewelry stores at discounted rates or according to your personal preference. You can also purchase these jewels on the internet. 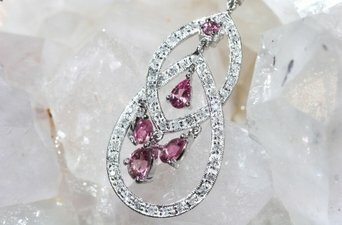 You will have to pay for shipping and handling when ordering online, but, some jewelers will shipped your merchandise free with a certain $100 or more purchase. The online jewelers have financing and insurance, free FedEx shipping, free gift packaging, jewelry appraisals, and 30-day returns, if you're not satisfied with your merchandise.